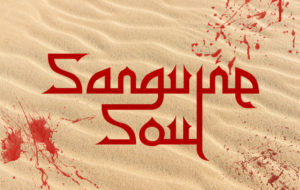 Sanguine Soul is an ability-based 1st-person shooter that takes place in a Middle Eastern setting. I served as Creative Director and Design Lead. My responsibilities included maintaining a cohesive vision, and leading our team of 3 designers. The most difficult part of this project was team size. I had never worked on a team that was this big, and making sure everyone had the same vision proved to be challenging. This issue was solved by using reference art and contemporary examples, as well as thrice-weekly meetings with the other team leads. This enabled us to make sure all team members had a firm understanding of the game. For the first two levels, I conceived them on paper, constructed them as whiteboxes, and designed their combat encounters. Once art assets were created, I completed an asset pass on the levels, making sure they were attractive without taking away from the design. Additionally, as new enemy types were created, they were added to the level in a way that preserved the difficulty curve. During this entire process, I conducted playtests and adapted the levels to the feedback received. I oversaw production of the final level, providing critiques and feedback. Another responsibility was implementing sounds. This involved diving into other people’s blueprints and figuring out how they worked. Then I inserted the sound, and made sure the timing for everything was correct. Additionally, I took advantage of the in-engine sound settings to make necessary adjustments. The biggest feature of Sanguine Soul is its combat. I worked with the Design Team to create ability and enemy concepts that fit our game’s scope. Additionally, we wanted our game to encourage movement in combat. To achieve this, the main ability is a dash that the player can use evasively and offensively. Additionally, enemies (such as the sniper) track the player, encouraging them to move around areas as they fight. To assist designers in the creation of these combat areas, I created a combat spawner trigger volume. When the player walks into the volume, it spawns enemies predetermined and preplaced by the designer. Additionally, it spawns in walls that prevent the player from progressing until all enemies are defeated. This greatly assisted our workflow for combat design. Creating interesting encounters at all points of development was challenging. I had to keep in mind players who don’t explore and therefore don’t have as many resources, as well as those who enter an area with full health and ability power. Additionally, it was important for levels to offer sufficient opportunities for the player to use their abilities, and increase enemy effectiveness. To encourage our movement-focused combat, main combat areas are large with open areas. This gives the player plenty of space to use abilities, and promotes evasion of enemy attacks.